Since April's birthstone is the king of all gemstones, the diamond, it's pretty impossible for me to make one list of my top ten diamond pieces. So instead, let's break it down item by item, shall we? 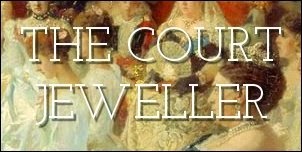 Today, I've made a quick list of my favorite all-diamond tiaras worn by royal women. There are about a million stunning pieces that didn't make the cut, so be sure to add your list in the comments below! This tiara started out as a necklace, given in 1879 to Queen Emma of the Netherlands. The setting may be simple, but the glitter of these impressive diamonds more than makes up for it. One of the very largest tiaras still worn today by a royal lady, this nineteenth-century piece can be seen gracing the head of Grand Duchess Maria Teresa at major events. Bought in 1879 for Queen Maria Cristina, this piece left the Spanish royal collection during their exile in the twentieth century. Franco reacquired it for Queen Sofia as a wedding gift, and the Spanish royal ladies have been donning it regularly ever since. Princess Sibilla acquired this versatile diamond tiara (probably as a gift from her family) after becoming a member of Luxembourg's grand ducal family; its gorgeous Art Deco design also allows it to be worn in two distinct versions. This piece, which originally belonged to Queen Victoria of Sweden, is everything you'd want a sunburst tiara to be: uniform, striking, and oh-so-sparkly. One of the many treasures of the Leuchtenberg family, this all-diamond tiara is now worn by the Queen of Norway. Made by Cartier in 1905 as a wedding gift for Princess Margaret of Connaught, this lovely tiara has become a sentimental wedding diadem for the descendants of Queen Ingrid of Denmark. From 1820s imperial Brazil to present-day royal Sweden, this intricate and enormous diamond tiara makes a serious statement. It's also the perfect tiara for Queen Silvia, whose mother was born in Brazil. Classic and balanced, this fairytale nineteenth-century tiara from Queen Mary's collection has become the favorite sparkler of her granddaughter, Queen Elizabeth II. Can you beat a wall of diamonds? I don't think you can -- and the fact that it's been an important part of Queen Elizabeth II's tiara arsenal for more than half a century says it all!